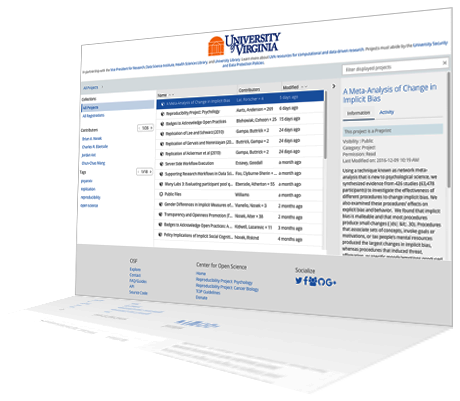 Organize and increase visibility of your institutional research. OSF Institutions is a scholarly web tool that enhances transparency, fosters collaboration, and increases the visibility of research outputs at leading research institutions. The Center for Open Science partners with these institutions to create central hubs for research projects on a branded, dedicated OSF page. Single sign-on authentication creates a seamless and integrated framework that accommodates custom research workflows and streamlines institutional data management. You can focus your efforts on generating and sharing research, not on building and maintaining research infrastructure. OSF integrates data repositories, study registries, computational services, and other services researchers use into a single workflow. This increases accessibility, usability, and reproducibility and reduces the time spent tracking down and collecting data sources. Researchers create projects, add content, and document the activities of labs, teams or larger consortia of researchers around the world. Built-in version control, granular privacy controls, integrations with other services, and citable persistent identifiers streamline researcher workflows and incentivize sharing. OSF makes transparency and collaborating easy and can be tailored to individual needs. Share work publicly, only with collaborators, or provide access to select groups. Customizable permissions allow you to share what you want, when you want, with whom you want, and ensure that private content stays private. OSF provides highly secure, redundant archiving services for confident preservation of research materials and data.